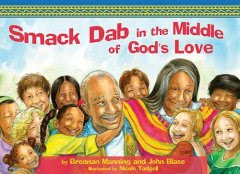 Typical of Manning's style of writing on Abba's love, this first of his children books, is a delightful story outlining the fact that God, as our Heavenly Abba, wants us to enjoy his blessings more than anything we have done for Him. His love is pure, simple and fatherly. Nonetheless, I find this Manning's book does not really flesh out concrete enough. The core message was not really put forth clearly. Probably a little conclusion section at the end to encapsulate the core message would help. Other than that, this book is beautifully illustrated, and simple enough for children to understand.